Welcome! We are glad you’re interested in our partner program. First things first, affiliates are a very important part of our growth strategy. And we want to partner with like-minded people to grow collectively. As a Putler affiliate, you’ll earn 20% recurring commission from every successful referral. Regular recurring income, very little effort ? If you want regular, recurring income; and that too without a lot of work, Putler’s partner program is the perfect opportunity. If you built your own software / SaaS business, you’d have to worry about technology, product-market fit, sales, customer support, ongoing updates.. There are so many moving parts… And after all that, what’s the final profit you’d be left with? 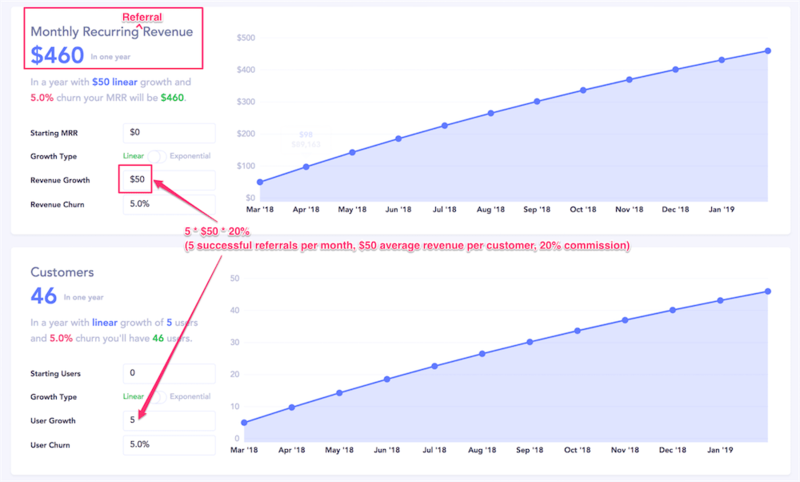 On the other hand, if you leverage your influence, and get 5 new customers for Putler every month, who generate $50/month on average, within twelve months, you’d start generating commission income of $460 every month. In two years, this can reach $700/month..
That’s what the graph shows above! If you want to play with those numbers, just click here. And if you get 50 customers in your first promotion, you could get a huge headstart of nearly $500 in commissions every month! Making referrals is quick and simple. STEP 1: Use the link above to join the affiliate program. Fill in your details. We will evaluate your affiliate request and get in touch with you ASAP. STEP 2: After our evaluation, we will send you a confirmation email with login credentials. STEP 3: You will get a referral link, and can start promoting. Login to our affiliate area to review stats. For best results, run a promotion campaign quickly after you’re approved. The whole affiliate program works on sharing. The more you share about Putler, the more are the chances of you making a sale using your exclusive affiliate link and finally earning more commission. Add details about Putler, along with your affiliate link, to any pages or posts you have on how to track and measure business goals / carryout business analytics / get detailed ecommerce reports. Add Putler to your Resources page on your blog as your recommended tool for business analytics and reporting. Anything else you can think of! PS. If you have other innovative ideas feel free to discuss it with us. Our affiliate program is pretty simple, but we need a few rules in place to prevent abuse. 1. Payouts are currently made on the 10th and 20th of each month. 2. The affiliate commissions are approved 30 days after every sale. This is to accommodate refunds if initiated after the purchase. Note: If a refund is initiated the referral commission also gets canned along with the refund. Putler doesn’t have a refund policy but we do offer refunds in a few special cases. 3. The Affiliate commission should be minimum $100 to make the payout. Incase, your commission is lesser than that, you will have to wait until the commission reaches $100. 4. Self-referrals are not allowed. The point is to get you to refer other people. This is not a way to get a discount on your own account. 5. Abuse, gaming, or shady behaviour will get your account banned. Just be honest. 6. We reserve the right to change the terms at any time. Not signed up for the affiliate program yet?